However, Grante proved the impossible, and not just because of a nearly full house. If I admittedly walked a reluctant “pathway” to my seat, I was completely absorbed by Grante’s “architecture”. The pianist’s interpretations have deepened and darkened since his 2007 Music and Arts CD release of all three sonatas. Grante constantly sublimated his frighteningly proficient technique toward musical ends. He unified the First Sonata’s sprawling outer movements with strategically-placed tenutos and accents, and played down long stretches of sequential padding in order to focus on inner voices and harmonic felicities that elude other pianists. By emphasizing the Scherzo’s “merry-go-round” offbeat chords over the lilting melody they support, Grante was able to effect a surprisingly powerful transition into the Polonaise trio. The terser yet less thematically interesting Second Sonata followed. Again, Grante’s judicious tempos (his characterfully deliberate handling of the Scherzo’s “clucking” repeated chords), meticulously thought-out balances between hands, and sense of transition held sway. In fact, both sonatas seemed to go by fairly quickly, and not just on account of Grante omitting the first-movement exposition repeats. The Third Sonata, the so-called Concerto Without Orchestra, occupied the concert’s second half. Grante opted for Schumann’s original 1836 first movement text and the composer’s 1853 revisions of the remaining movements. Here the pianist observed the first-movement repeat, muting the dotting chords yet driving the louder sections more intensely the second time around. The finale stood out for Grante’s wide portfolio of tone color and textural blends, abetted by his Bösendorfer concert grand’s distinct timbral characteristics between registers. A master of subtle pedal effects, Grante is not afraid to blur a chord or slightly overlap connecting notes in order to create the illusion of sliding between pitches. This allowed for Grante’s softest legato lines and disembodied diminuendos in all of the sonatas’ slow movements to truly sing and shimmer. The First Sonata’s brief second-movement Aria was particularly beautiful in this way, and even more beautiful when Grante offered it as his only encore. Such a gratifying recital bodes well for the cycle’s all-Brahms conclusion in February 2015. Like this post? Then please share it. 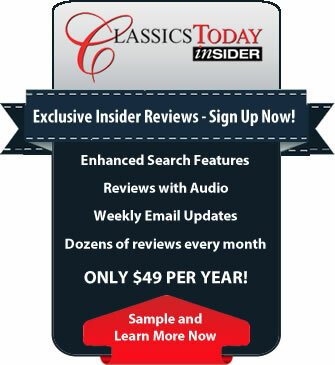 Fill in your email address below to receive email updates for any new editorial content posted to the Classics Today website.